If you loved Super Big Slots, you’re going to go WILD for this one! Super Big Wilds mobile slots is the latest installment in the Super Big online slots series, and it comes with a huge special feature. You guessed it! It has super-big Wild symbols! 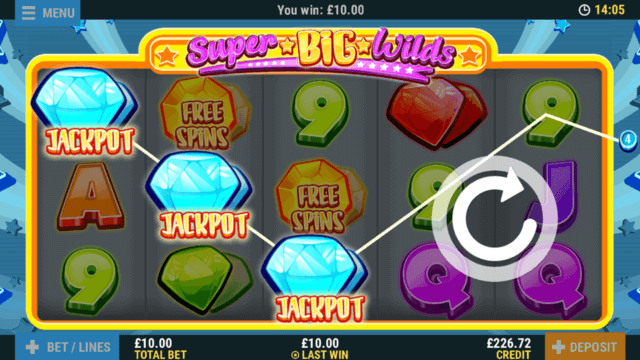 Super Big Wilds is PocketWin’s first game to feature Banner Wilds in Free Spins mode. Why is that such a big deal? Well, as the Wild symbols in Free Spins mode are three storeys high, they can massively boost your winning potential. Before you go wild and start spinning, you’ll need to decide on your total bet amount. This is how much each spin will cost you, and it’s calculated by multiplying together your bet-per-line and the number of win lines you want to play on. To set this, press the blue ‘BET/LINES’ button to the bottom left of the reels. Set your bet-per-line and choose how many of the 20 win lines you want to play across. Your bet-per-line can be anything from 2p up to £5. So, for example if you bet 10p per line on all 20 win lines, your total bet will be £2. As you alter your settings, you’ll see the ‘Total Bet’ amount adjust automatically. Ready to play? Hit the white floating arrow to spin. If hitting that arrow button every time you spin feels like too much of a big effort, you’re in luck! There’s an ‘Auto Spin’ feature built in that can do it for you. Just tap ‘Auto Spin’ within the ‘BET/LINES’ menu and choose a number of spins. You’ll need to set a minimum credit level that you don’t want to fall below, and you can also set Auto Spins to stop if you have a single win exceeding a pre-set amount. Hit ‘Stop’ at any time to return to manual play. If your Total Bet settings are looking super, all that’s left to do is tap that white floating arrow and fire up those super-sized reels! They’ll spin and stop at random, and if you’ve lined up three or more matching symbols on an active win line, you’ll have a win! How much that win is worth will depend entirely on which symbols you have, and how many. You’ll find all of that important info in the paytable. Just click the menu button in the top left corner and select ‘Paytable’ to view this. It shouldn’t be a massive surprise to hear that, like all of our games, win lines in Super Big Wilds pay from left to right. Whenever you have a win, you’ll see the lines you’ve won on come to life on screen, and the amount you’ve won will automatically big-up your credit balance. Each combination of symbols has a multiplier attached, which will be applied to your original bet-per-line when you spin in a win. The more matching symbols you manage to line up, the bigger that multiplier is likely to be! It’s always a good idea to check the Paytable before you play so you know which symbols are worth what. Remember – you’ll find that when you click the menu button in the top left corner and select ‘Paytable’. Now this shouldn’t be a huge issue, but you can only win once on each individual line. So, if you have more than one winning symbol combo, only the highest value win will count. However, win on more than one line in a single spin and we’ll total up all of those prizes and you’ll receive one massive win! Super Big Wilds is all about those Wild symbols, and there are two types you’ll need to look out for. The first is your standard blue Wild symbol. This can stand in for any other symbol on the reels, except for Free Spins. So for example if you lined up two 9s with a Wild alongside, that’ll give you a win worth three 9s. Now pay attention because this is a big deal: you can’t win the progressive Jackpot with a Wild symbol on your winning line, but don’t worry. If you spin in four Jackpot symbols and a Wild, you’ll still receive a win worth celebrating. The second type of Wild symbol is the banner Wilds. These come into play when you enter Free Spins mode, and they work in exactly the same way – they’re just bigger! Find out more about how banner Wilds work in the Bonus Free Spins section. Super Big Wilds has a very special Free Spins feature that could give you a gigantic win! Spin in 3, 4, or 5 Free Spins symbols anywhere on the reels and you’ll receive 5, 10, or 15 free spins respectively. That’s not all though! When you enter Free Spins mode, you’ll also activate those mega banner Wild symbols. Banner Wilds are always three storeys high, but they can roll in with one, two, or all three storeys in view on the reels. They work exactly the same as normal Wild symbols, but as they can span the full height of the reels, they can grant you a win across more win lines. When your free spins are used up, the banner Wilds will disappear and you’ll return to normal play. Your bet settings will lock to the values of your last paid spin while you’re in Free Spins mode, but you won’t be charged a penny for them. When you run out of free spins, your total win will be tallied up and you’ll see one big win displayed on screen. Super Big Wilds mobile slots has a theoretical return to player of 94.50%. This is based on long term playback.